IPEIA is very pleased to announce the overwhelming positive response from all the exceptionally generous companies/associations who are committed to supporting this industry through the IPEIA Sponsorship Program. It is with sincere thanks that we recognize each and every sponsor. We encourage you to visit our sponsorship page both within the new Conference App as well as on our website and look through the full list of companies who have helped make our conference successful for over 20 years. As part of our commitment to raising the bar, we want to maximize our sponsor’s exposure and with this we hope to introduced digital signage throughout the 2018 conference and will continue to offer this new updated look for the 2019 conference. We plan to take advantage of all the available resources that the Banff Center has to offer, ensuring a professional and polished, cost-effective solution to signage. 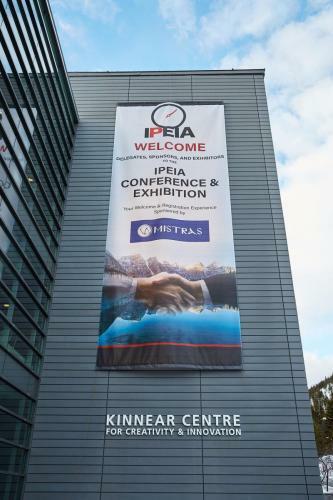 Your participation and visibility stimulate innovative thinking amongst the IPEIA delegates, your continued support will also emphasize your company’s commitment to the industry. Participation in the IPEIA sponsorship program is a highly visible, cost-effective way for your company to showcase your products and services. Make conference delegates aware of your commitment to the pressure equipment industry by investing in a corporate sponsorship. Your corporate logo in electronic format on our new conference website with a link to your company website for one year. Your corporate logo on display on site at the Conference. Public acknowledgement at the conference speaker venue. Constant visibility and acknowledgement on the Conference App. Please Note: The IPEIA Public Relations Committee has made a commitment to raising the bar for the Sponsorship Program by increasing sponsors exposure and ensuring a professional standard of excellence is met. IPEIA is proud to recognize the major role our sponsors play in supporting our non-profit association. Through their funding, IPEIA is able to continue providing a forum for the pressure equipment integrity community and promoting the industry through education initiatives. There are many opportunities for a company or individual to help support IPEIA. Some examples include: sponsoring the delegate coffee break, becoming a media sponsor to promote our message, or sponsoring a social networking event for all delegates. All forms of sponsorship, regardless of monetary value, deserve the same treatment and esteem from all individuals. IPEIA is built by a community wishing to further the pressure equipment integrity industry and everybody should feel welcome and valued. We ask that all individuals attending the conference act in a professional and ethical manner, respecting each other’s brands and affiliations. To all of our sponsors, we recognize the importance of your partnership and extend our sincere gratitude for the support you provide to the industry. Conference App Conference Year CSC Valves Canada Inc.
Thursday Conference Working Lunch Thurs., Feb 28 RAE Engineering and Inspection Ltd.
Hotel Cards All Week Optic QA Field Services Inc.
Technical Program Presentation Wed., Feb 27 – Fri., Mar. 1 Streamline Inspection Ltd.